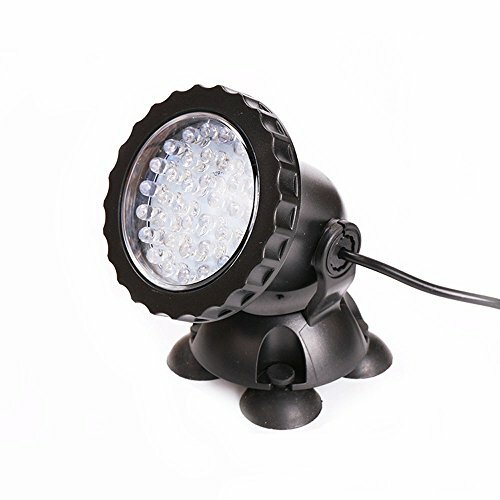 Efanr LED Underwater Spot Light 36 LED Color Changing Submersible Lamp Spotlight for Aquarium Fish Tank Garden Fountain Pond Pool Lighting Decoration | Fountain City Art Ctr. Adopt advanced inject molding engineering plastic ABS material, durable, environmentally friendly. Waterproof: Completely submersible in salt water or fresh water,Suitable for your fish tank,Swimming pool,Fountain,Pond,aquarium. Safety working:DC 12V safe working voltage, without any risk to human and fish, safe and reliable. Easy to Install:Designed with powerful sucker on the base, easy to mount and fix.